Cargoes from shipwrecks, filled with silk, tea, spices and prized Chinese and Southeast Asian ceramics, attest to the vigour of trade and the rich cultural history of the Asian region. Trade flourished from the 14th to 19th centuries. Chinese junks and Portuguese, Dutch, Spanish and English galleons were among the many ships actively plying the South China Sea, the Manila to Acapulco route and beyond, forming a ‘Maritime Silk Road’. Ships laden with ceramics, and the especially esteemed blue and white porcelain, tell the story of wares highly valued throughout Asia, the Middle East and eventually Europe. Known for their beauty and utility, Asian ceramics offered a wide variety of forms, glazes and designs popular centuries ago and still popular today. 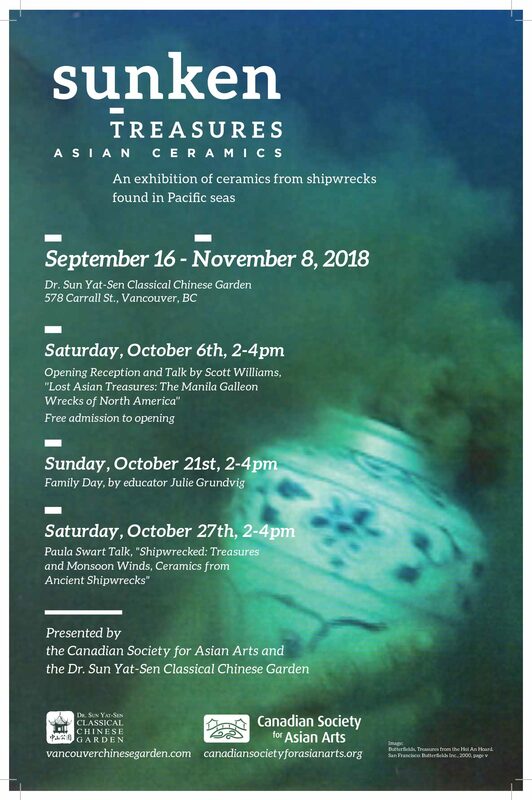 The Sunken Treasures exhibition presents shipwreck ceramics: snapshots in time that expand our knowledge and appreciation of cultural treasures from long ago, retrieved only recently from the bottom of the sea.